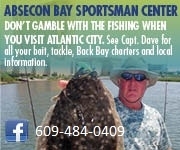 By water we are located on Absecon Creek. To find us take the Absecon Channel which connects with the Inter Coastal Waterway at the AB marker and head approximately West between the State Bouys and to the wooden stake channel which will take you across Absecon Bay to the mouth of Absecon Creek. Follow the Creek past the Faunce Landing Boat Ramp, past Absecon Marine and Up the Creek Marina. One more bend and you are there.